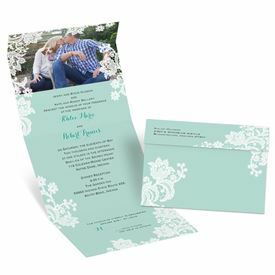 A layer of white vintage lace appears as if carefully draped along the outer edge of these seal and send wedding invitations. Your photo appears at the top and your wording appears below. Background and wording are printed in your choice of colors and fonts. Personalization Options: Background is printed in your choice of color. Design is printed in white. Your wording is printed in your choice of colors and fonts. Your choice of photo. The invitations were received in a timely manner and they look beautiful. It made us even more excited for our upcoming wedding day. Quality paper, quality printing and photo. The design process was easy as well. The design is beautiful. I called customer service several times to make changes on my proof, everyone I spoke with was very helpful and courteous. The last Rep zip spoke with cant remember her name was extremely helpful and gave me her input on the wording. The shipping time was fast and on time. I would definitely recommend. These invitations were amazing! They had everything included (even the adhesives to seal the invitations) and the price is absolutely a bargain! you don’t even need envelopes. Most importantly they were so beautiful and I’m so happy I could change the color to the color I wanted. I couldn't be more pleased with these invitations! I absolutely love the all in one design, and for the quick production time and high quality, the price was incredible! I was able to save hundreds of dollars on my invitations without compromising what I really wanted. They look absolutely beautiful! Note: they come with enough clear seal stickers for the front and sides of each invitation, which was a bonus I hadn't even realized I needed. No envelopes, but you will need to fold them on the creased lines. Totally worth it to me- if you have all those separate cards, rsvp envelope etc, you're doing some assembly anyway. I just ordered these on 7/29... and I ordered them late in the evening and received them today 8/3. I was nervous because my wedding is in 3 months and heard horror stories about how long it took to get invitations. And these turned out amazing and I got them in less than a week... what more could you ask for! Legible, beautiful colors, and it's an all in one invitation. I didn't even purchase the envelopes. Affordable, and great quality. 10/10 from me! Thank you so much! !